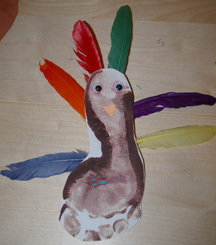 Here’s a fun turkey craft that involves the whole family. I’ve seen several variations recently on Pinterest. We traced Dad’s hand, Mom’s hand, and our son’s hand to make the feathers. A perfect craft for Thanksgiving! 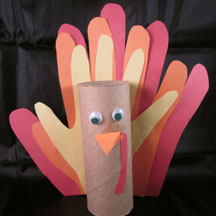 What You Need: 1 toilet paper roll; yellow, orange, and red construction paper; pencil (for tracing); scrap of red paper (for wattle); scrap of orange paper (for beak); 2 googly eyes; glue; scissors. How to Make It: Trace each family member’s handprint and cut out. Glue, staggered, on top of each other as shown. Glue set to back of toilet paper roll. Cut out wattle and beak (folded or just a triangle) and glue toward top of roll. Glue on eyes.